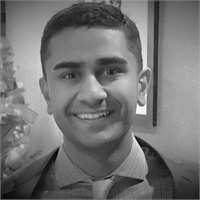 Sachin is a graduate of Nichols College with a bachelor's degree in Business Management and resides in Somers, CT. He joined Aegis Wealth Partners because he wanted to own a business and help others avoid financial distress. Prior to joining Aegis Sachin worked in a physicians office where he saw first-hand how financial organization plays a crucial role when your health is compromised and the unexpected happens. Now, Sachin leverages the support of the firm to develop his practice which is focused on protecting those who help us when our health changes, medical professionals. While working with Sachin physicians, surgeons, nurses, and residents learn how to protect their most valuable asset, their ability to earn an income. From his experience working in doctors’ offices Sachin also explains how to protect the doctors practice and their key employees. In his free time, he enjoys playing basketball, weight training, and spending time relaxing with friends and family.